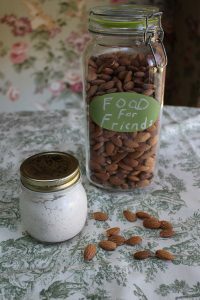 I love almonds and they make wonderful kefir. Some people call almonds the healthiest food in all the world and they have tons of health benefits. But I know a thing or two about almonds that perhaps you do not know. Researchers fed fifteen healthy subjects three different types of meals. 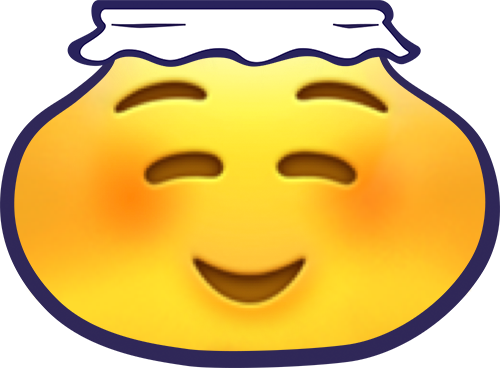 Meal One – almonds and bread, Meal Two – parboiled rice and instant mashed potatoes, Meal Three – different types of breads. They took blood samples after each meal and four hours afterwards as well. The results showed an increase in protective antioxidants after the almond meal but not after the other meals. There was also noted a lowered rise in blood sugar and insulin in the meal that contained the almonds. More research shows that eating almonds along with higher glycemic foods will actually lower the glycemic index of the meal and lessen the rise in blood sugar after eating. (Jones AR, Kendall CW, Metabolism) But this isn’t why I love almonds. Almonds have an abundance of Vitamin E – you get 37% of the recommended RDA in one ounce of almonds. Vitamin E is very protective of the heart and can reduce heart disease risk. In the British Journal of Nutrition, (Kelly JH, Sabate J.) researchers looked at four large groups —the Adventist Health Study, Iowa Women’s Study, Nurses’ Health Study and the Physician’s Health Study. When evidence from all four studies was examined, they found that the subjects who consumed nuts at least 4 times a week showed a 37% reduced risk of coronary heart disease compared to those who never or seldom ate nuts. But it got even better! Each time they had another serving of nuts during the week, it reduced their risk of coronary heart disease an additional 8.3%. But this isn’t why I love almonds. Do Almonds Keep You From Gaining Weight? Many people avoid nuts for fear of weight gain. A study published in the journal Obesity in 2007 showed that people who ate nuts at least twice a week were much less likely to gain weight than those who almost never ate nuts. This was a 28-year study with both men and women involving 8,865 people in Spain. Those who ate nuts at least two times per week were 31% less likely to gain weight than those in the study who never or almost never ate nuts. But this isn’t why I love almonds. I love almonds because they have discovered them to be prebiotics, food for bacteria! Substances in the almonds, and also in their skins, have been found to boost the good bifidobacteria and lactobacillus in the gut. 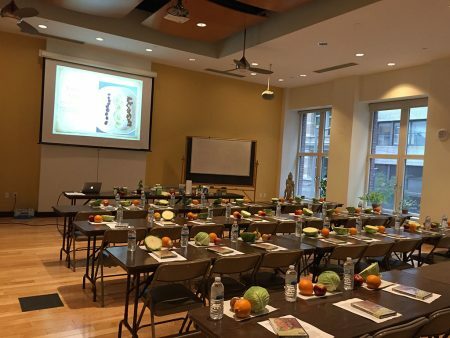 A total of 48 healthy adult volunteers were split into 3 groups . The first group consumed a daily dose of roasted almonds (56 g). The second group ate almond skins (10 g). The third group took a prebiotic supplement, fructooligosaccharides (FOS), (this is found in Prebio Plus) (8 g) (as positive control). The subjects taking the almond skins and the FOS had an immediate increase in good flora and at six weeks the roasted almonds subjects began to see the same increase, it just took longer. The almonds and the prebiotic FOS increased the bifidobacteria and lactobacillus, they did not increase E coli, and the growth of the pathogen Clostridum perfringens was significantly repressed. So this means if you take almonds and make them into kefir you will increase not only the qualities of colonies of bacteria in your gut, but you will also allow them to multiply and grow, becoming strong and changing you from the inside out. I love this! Almonds are food for our 100 trillion microbe friends and we always need more quality friends. Did you know that your good bacteria lower your cholesterol by using cholesterol as a food source? 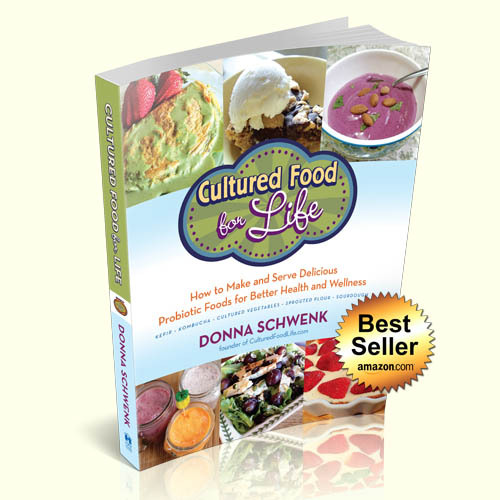 (info in my new book) Did you know these good bacteria also reduce inflammation and protect your heart by keeping away endotoxins that can get into the bloodstream? 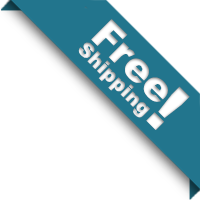 Endotoxins are found in disease-causing bacteria that can penetrate a weakened gut lining. When endotoxins are released, our immune system sends out an alarm and creates inflammation throughout the body. 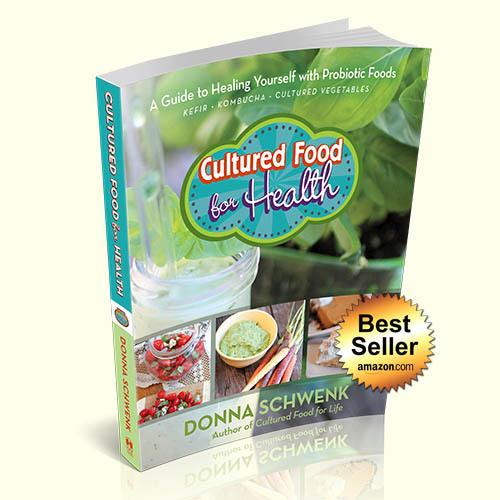 You need to feed your bacteria lots of fiber-rich foods or your healthy bacteria starve to death inside your gut and then you wind up with leaky gut and a host of other problems. So you know . . . maybe it’s not just the almonds? Maybe the almonds are feeding the bacteria along with all the pre-biotic fiber-rich foods (fruits, vegetables, nuts, and seeds). Maybe all this time when we thought it was fruits and vegetables keeping us healthy, it was actually because these fruits and vegetables were feeding the good bacteria and this is what was keeping us well? We are 99% microbial. It’s what we are mostly made of, and those unseen microbial friends do a lot for us and get very little credit. So why do I love almonds? Because they feed my friends and keep me healthy. That’s really why I love almonds. Happiness is having friends who feed you. 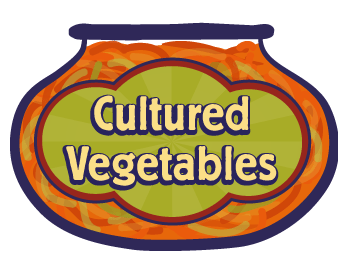 Check out the recipe below and pick the culture you’d like to use. It’s super easy! 32 Responses to "Reasons To Love Almond Kefir"
Donna, I made my first batch of kefir…almond milk kefir…and am now trying to spoon out the grains. Not sure how to do this as the kefir curdled and separated and I don’t know the grains from the curds. Not sure what to do next. I haven’t even tasted it yet. Use a rubber spatula and stir it around until the kefir goes through the strainer. Let it ferment for a shorter time next time. I think you can although I’ve never tried it. 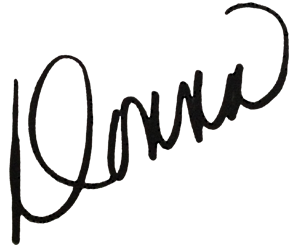 Donna, Continue to love and appreciate all your work and good information. The almond kefir sounds yummy…will have to try this. Also, am wondering if the fermentation process for kombucha takes or reduces the caffeine of the tea. 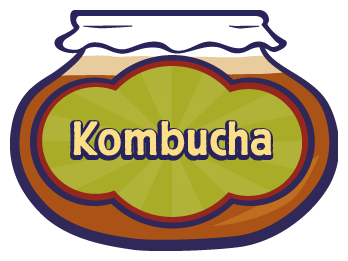 I use a combo of black and green tea and sometimes feel I get a “caffeine buzz” after drinking the kombucha. Thanks for any info you can pass on regarding this. 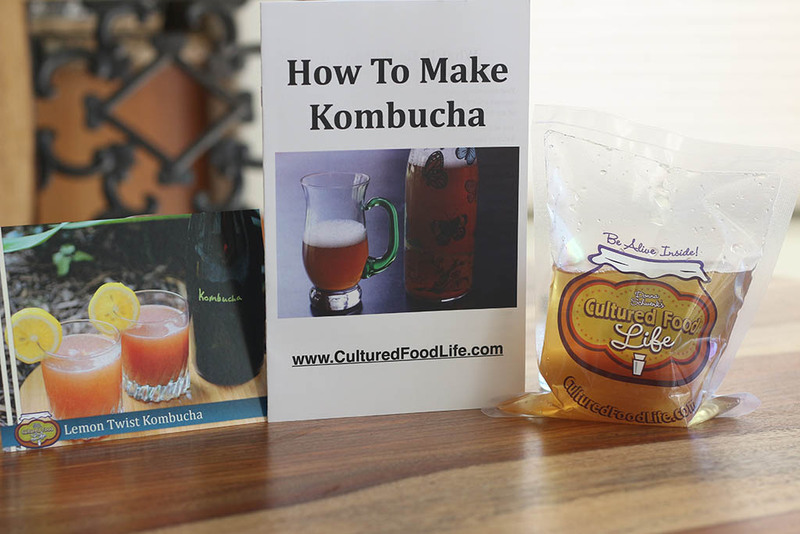 There have been studies that say it usually reduces the caffeine in kombucha by half. Donna, I tried the almond milk with my kefir grains but the nut bulk gets mixed with the kefir grains making them sooooo hard to strain out. What am I missing? They do stick to the kefir grains but they don’t hurt anything if they do. You can put the grains in a few tablespoons of coconut milk and swirl them around and a lot of it will be removed. You can add this extra milk to the kefir and it will give it a little extra food. Hi Donna! 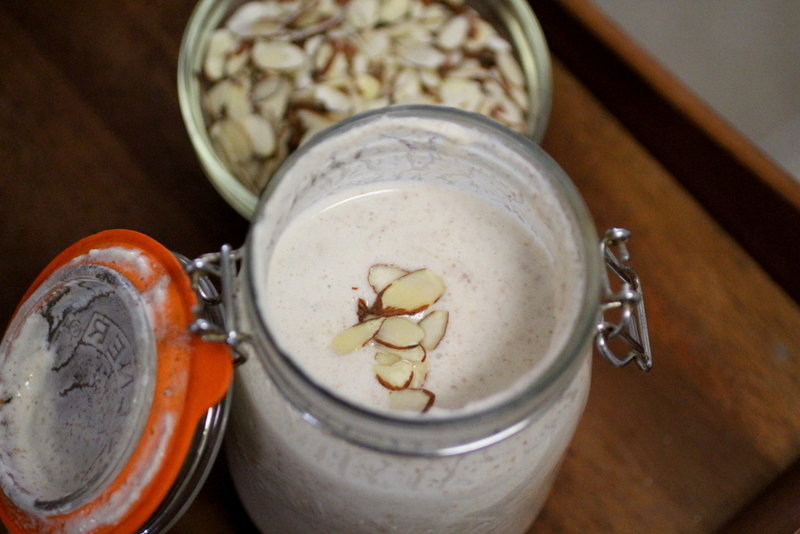 How do you work out the carbohydrates in the almond milk – if homemade? Thankyou ? 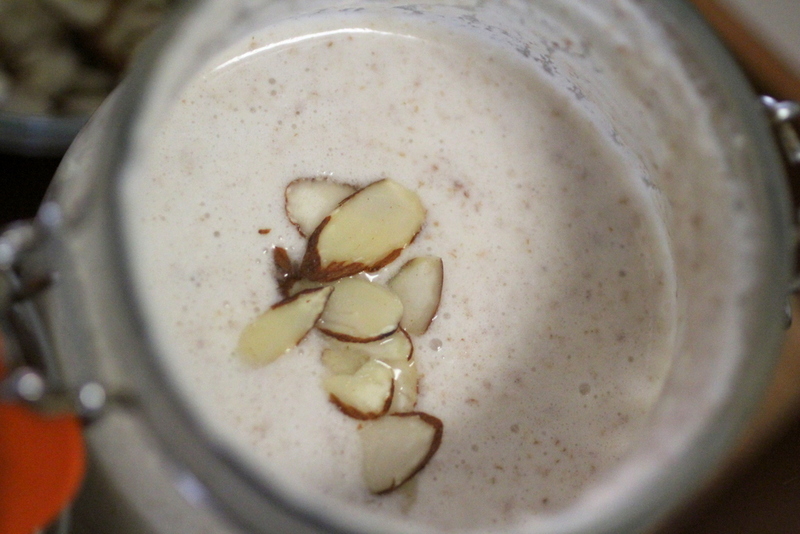 There is only 1 carbohydrate in homemade almond milk. I’m confused too. You say to tinamarie75 that you use the milk to make more almond kefir but when she asks if you still need the grains you didn’t answer her. 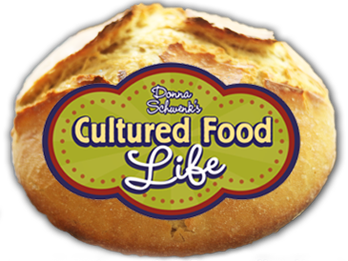 It sounds like you’re saying that the almond kefir itself will culture the next batch, minus any more grains. 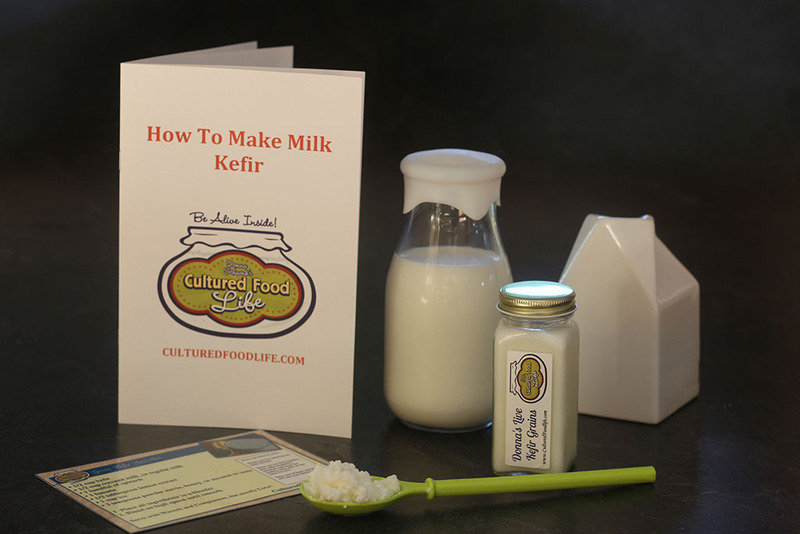 “Simply take a portion of this kefir, add it to new milk, and let it culture it again. You can do this up to seven times and in larger quantities. Or perhaps more than seven times if you do it every day like I do. Just keep doing it until it stops re-culturing, then you’ll know that you need to use another Easy Kefir packet.” but then you tell her you use the grains over and over again. I am worried about my beautiful grains in the milk- even with date paste isn’t water bad for them? You are adamant about never rinsing them with water (I use milk) but almond milk is water and almonds. So is it safe? I would love to make this but don’t want to hurt my babies. I bought them from you two or three years ago. 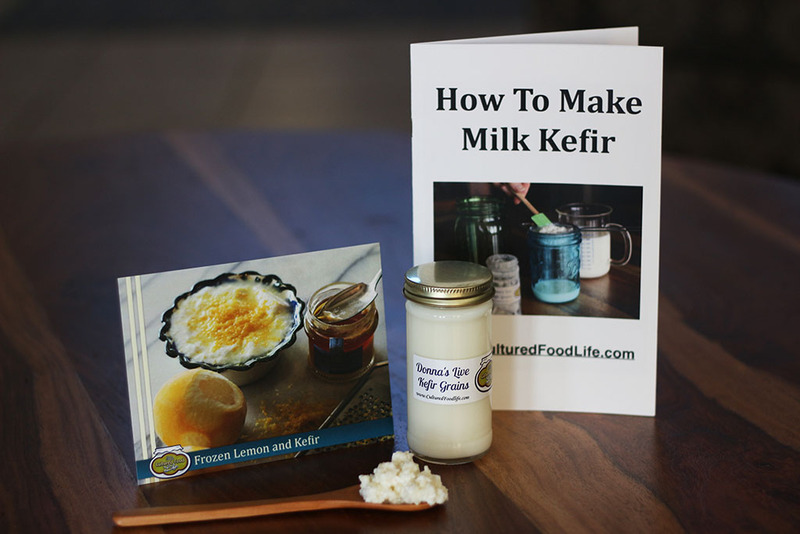 If you use kefir grains you always need to use kefir grains in every batch. 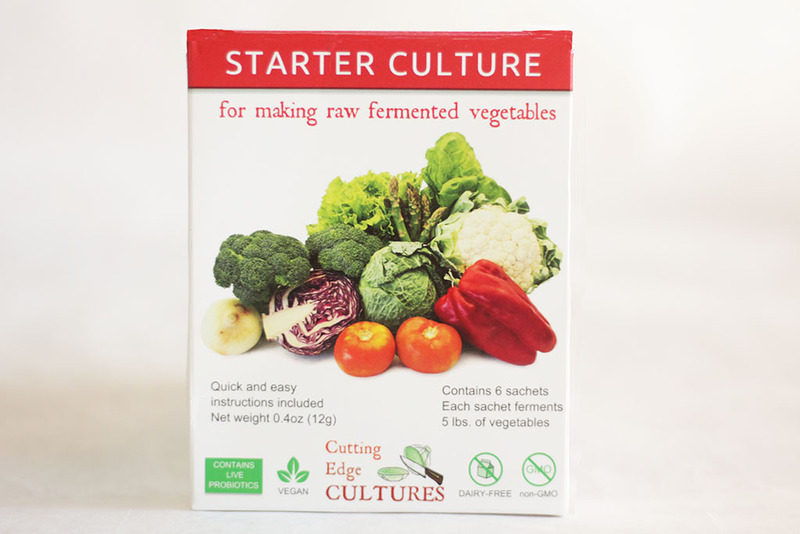 It won’t re-culture like the Easy Kefir. 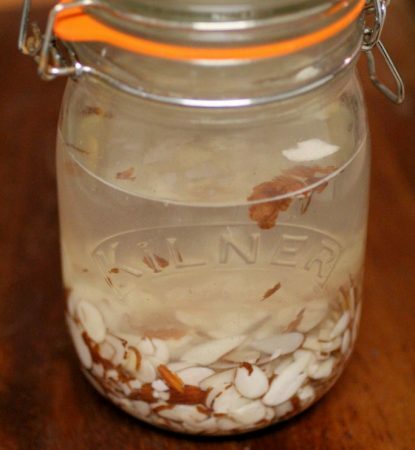 When making the almond kefir with living grains do you use milk kefir grains? Also can you continue using the grains over & over? Thank you! Yes, milk kefir grains and you can use them over and over if you feed them a sugar source. Donna, so thrilled to see more non diary options as I am both lactose intolerant and vegan, for numerous reasons. Since I was diagnosed with T2 diabetes and found out through intensive research that it was not a disease of too many carbs or sugar as I had been told, but of intramyocellular lipids – too much fat in my cells, that prevented insulin from doing it’s job of allowing the glucose into the cells for their energy use, causing it to spill into the blood and urine, therefore a SYMPTOM of the disease, NOT the cause! Following the low carb diet that was recommended got me nowhere, but I went out on a limb and gave a trial to a Neal Barnard/McDougall/Esselstyn/ style high carb, low fat, whole plant food diet, and lo and behold, in under 2 weeks, no more diabetes, arthritis, fibromyalgia, IBS, high BP, cholesterol, etc etc, and went on to get off about 15 different meds including narcotics. 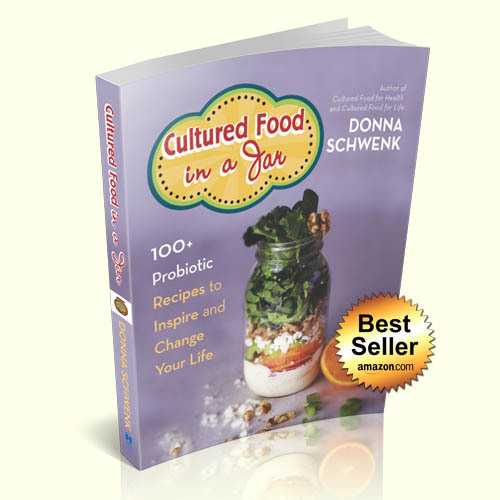 I started adding in fermented foods too and over about a year and a half, lost half my body weight. I feel better mentally and physically at 63 than I ever have, and I’m so grateful I have found you wonderful, helpful people…literal lifesavers! This is wonderful and you should be proud! See how smart you are? You followed your own instincts and found your way to wellness. Makes me smile! Thanks for sharing. I am so encouraged by your story!!!!! So many ppl suffer and this is a great testimony to never quitting until you find the right path! WOW! Thanks for all you and Donna do to help us!!!!!! f you would like to make more almond kefir, take 1/4 cup of this almond milk kefir, add to 3 – 3/4 cups of fresh almond milk, and culture again for 16-24 hours or until tart. You can do this many, many times over or until it stops working and making the milk tart. Then you will need a new Easy Kefir package. 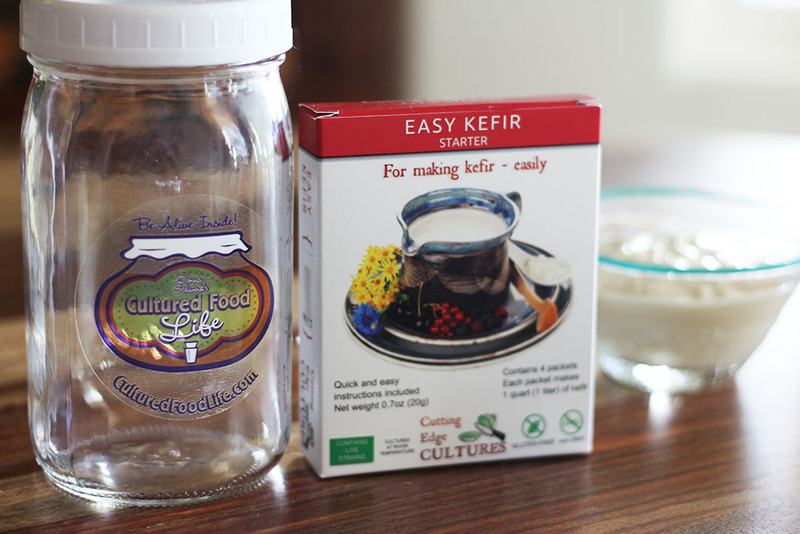 Once you’ve made your first batch (quart) of kefir, you can use some of it to make more kefir, so don’t drink all of it! 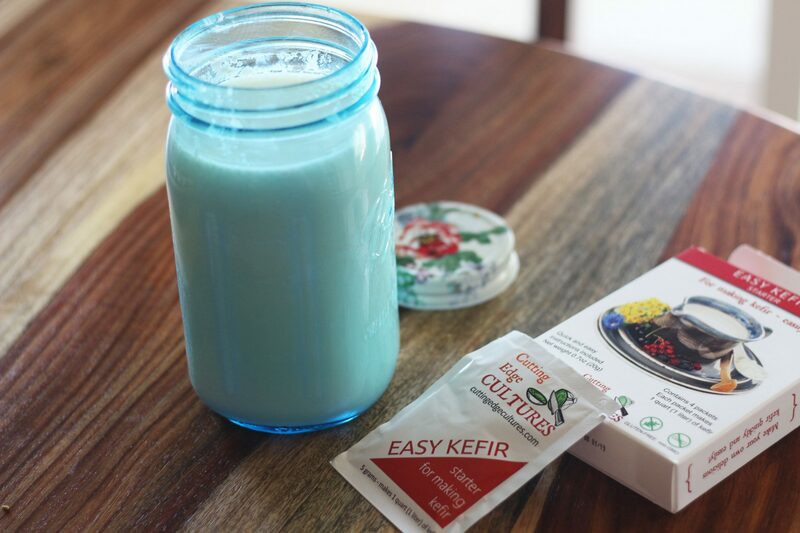 Simply take a portion of this kefir, add it to new milk, and let it culture it again. You can do this up to seven times and in larger quantities. Or perhaps more than seven times if you do it every day like I do. Just keep doing it until it stops re-culturing, then you’ll know that you need to use another Easy Kefir packet. To make 1 quart: use 1/4 cup from the previous batch. So you never have to add grains in if you save at least 1/4 cup from previous batch? Grains you have to use over and over. 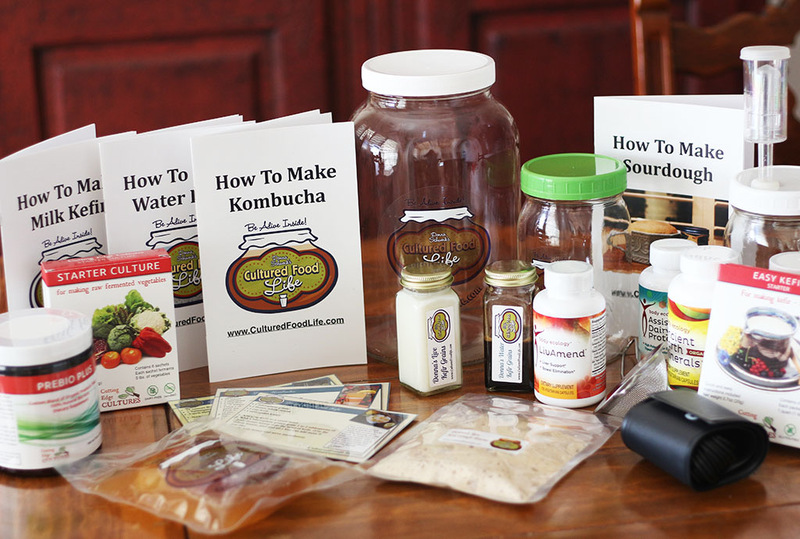 This is only if you uses the Easy kefir packages. You need to look at the recipe. 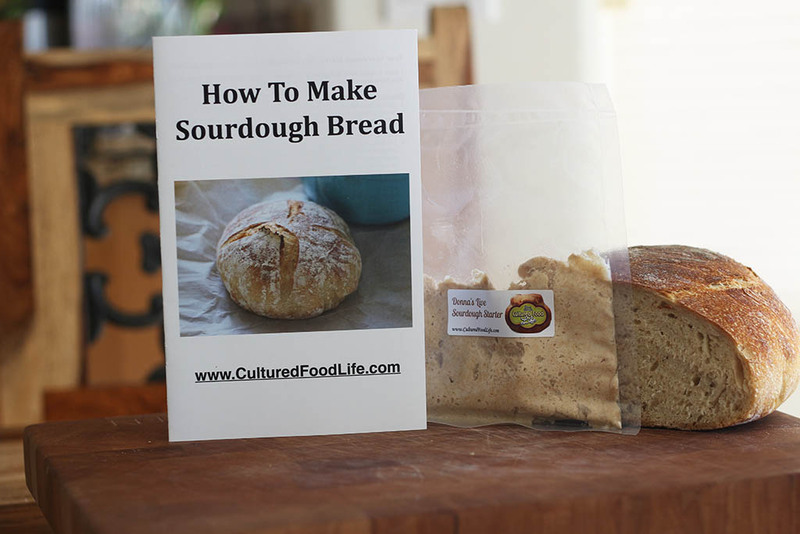 There are two separate ways to make this, and they are listed on the recipe. One with live kefir grains and one with Easy Kefir packages. Each one has its on instructions. Donna, I love almonds too and thanks for the info, but almonds are expensive so I eat a lot of pecans and peanuts, raw and parched. 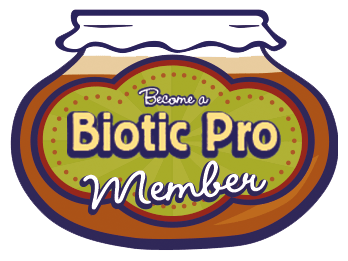 Could you tell me if pecans and peanuts have probiotics and good health benefits? After my kefir is ready I put a little coconut oil, half banana and a handful of nuts (whatever kind I have) and eat this with a spoon. So good to me. Thanks for all the great information! Have a couple questions..can I use almond meal in stead of whole almonds? If so, what would be the equivalent? Have you made cashew kefir? I don’t really know, I haven’t tried it but I think it would work. Whoops! lol wouldn’t that be nice if it could really do that! Thanks for the heads up, its been corrected. Ate we using milk kefir grains or water kefir grains? ? We’re using milk kefir grains. 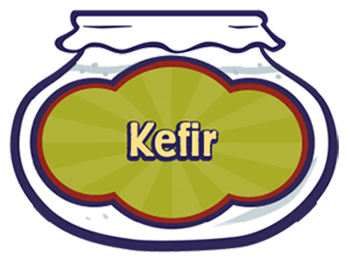 If you click on the words.” Live Kefir Grains” it takes you to the ones I use. 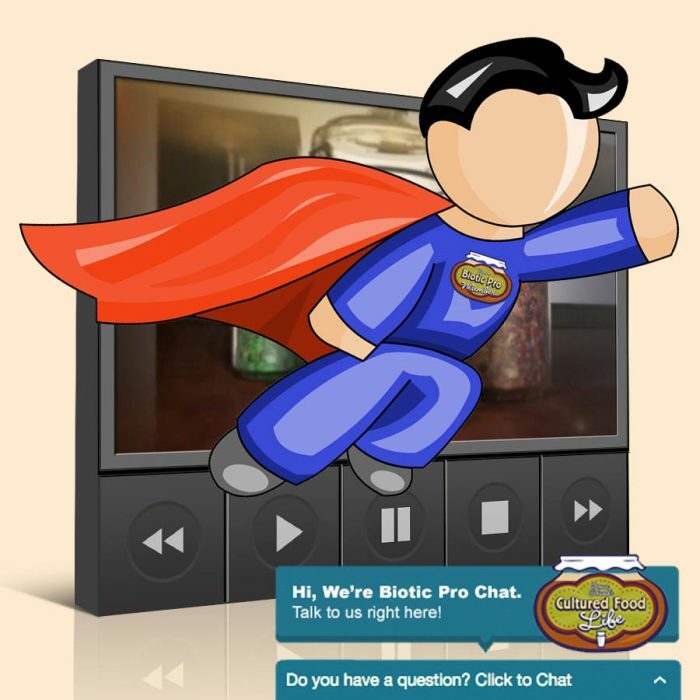 I just love your website and what I have learned here. You have truly helped me on a path to healthful eating. I am excited to try this almond kefir! I have recently cut out dairy for a while. I was making milk kefir all the time and I miss it. I have been making almond milk for a short time now, and I always strain out the ground almonds after blending with water in the blender. In your recipe it doesn’t mention to strain out the almond grounds. After the kefir is ready and it is time to strain it, is it difficult to separate the kefir grains from the almond grounds? Would the kefir come out okay if I strain the grounds out prior to making the kefir? Thanks so much for your help! Yes, you can strain the almonds out prior to making kefir. It won’t be as thick, but it will still give you lots of benefits. In your recipe for almond kefir using easy kefir you have add water? (step3). Then step 6 you say place coconut kefir in refrig. Do you mean place almond kefir in refrig? Then step7 you have to make more take 1/4 cup of the kefir and add ALMOND milk. Correct? In step three you do add the water. The water you soaked the almonds in you discard in the previous step. I correct step 6 thanks for telling me. Step 7 is taking the almond kefir you just made and adding 1/4 cup to fresh milk to make another batch, but you don’t have to make more if your not ready. You can just place it in the fridge.